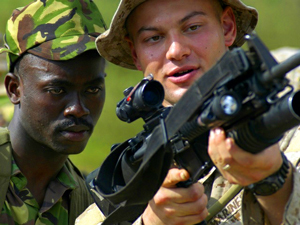 (FinalCall.com) - The number of recruits graduating from boot camps built with U.S. taxpayer dollars and staffed by State Department contractors in Africa is on the increase. Contracting out U.S. military operations has the effect of removing the shared experience by the American public, of a “national force in which citizens see the consequences of war illustrated by departing troops in uniforms and flag-draped coffins,” according to sociologist Katherine McCoy, writing in the 2009 issue of Contexts magazine. Doug Brooks, an expert on the private military industry and president of the International Stability Operations Association, appears to agree. “A lot of people see the use of contractors as a way of avoiding democratic accountability or a way of undermining democracy,” he said to WPR.